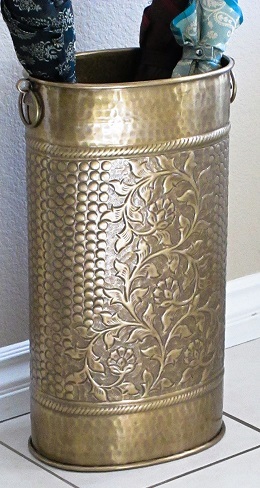 One of our finest umbrella stands in heavy weight solid brass with exquisite garden motif and hand-hammered detail. Oval shape measures 20.5" high, and 7.25 x 10.75" (measured across top opening). Hand-rubbed antique finish is lacquered to resist tarnishing. Solid brass ring handles and cast brass fittings add to the elegance of this piece. Another Excellent Accents exclusive !